This book of hours is illuminated in a style combining features typical of a group of manuscripts made in Suffolk, probably Bury St. Edmunds. Heraldry in one of the initials indicates that the manuscript was made for a member of the Hamelden family, of Holton St. Peter in Suffolk. This parish is on the outskirts of Halesworth, in an industrial estate where Bernard Matthews turkey products are made. 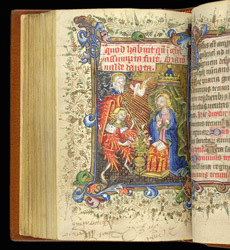 This miniature is a slightly unusual shape and size because it has been fitted into the available space after a rubric. The feather-covered angel is very unusual in such compositions, but is a typical feature of East Anglian art, and can be found in stained-glass, sculpture, panel painting, etc.